The obverse of the Abigail Fillmore First Spouse Gold Coin features her portrait as designed and sculpted by Phebe Hemphill. Obverse inscriptions include “Abigail Fillmore”, “In God We Trust”, “Liberty”, the order of the Presidency “13th”, years of the term “1850-1853″, and the date of issue. Abigail Powers Fillmore (March 13, 1798 in Saratoga County, N.Y. – March 30, 1853), wife of Millard Fillmore, was First Lady of the United States from 1850 to 1853. Abigail Powers Fillmore developed a passion for learning early in life. Financial circumstances forced her to begin working at the age of 16 as a teacher while she continued her own education. While teaching at the New Hope Academy in Sempronius, N.Y., she met her future husband Millard Fillmore. After their marriage, she continued to teach for another two years until their first child was born, making her the first presidential spouse to hold a paying job after her marriage. Throughout her life, she continued her zeal for self-improvement by reading voraciously, attending lectures and congressional debates, and participating in political discussions. 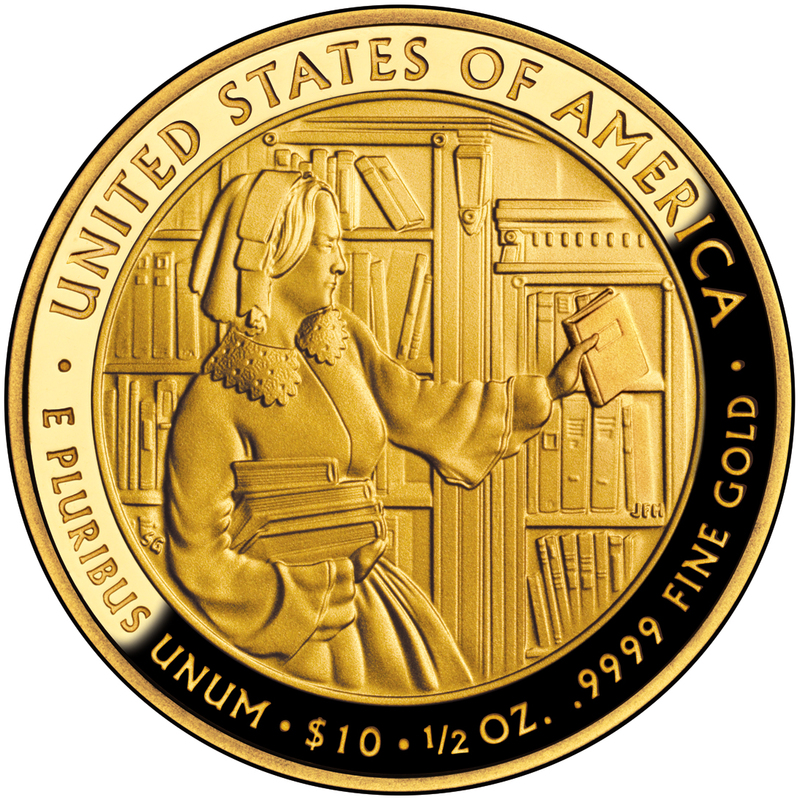 On the reverse is a depiction of Abigail Fillmore placing books on the shelf of the White House Library which she established. Inscriptions include “United States of America”, “E Pluribus Unum”, the denomination “$10″, the weight and fineness of the bullion “1/2 oz. .999 Fine Gold”. The reverse was designed by Susan Gamble and sculpted by Joseph Menna. Perhaps her most lasting contribution as first lady was her work in establishing a permanent White House library, for which President Millard Fillmore asked Congress to appropriate funds. With $2,000 authorized for the project, Mrs. Fillmore acquired several hundred volumes to start the collection in a second floor oval parlor. Here, she enjoyed entertaining such guests as authors Washington Irving, Charles Dickens and William Makepeace Thackeray. Mrs. Fillmore also spent many hours selecting and arranging books for the library. 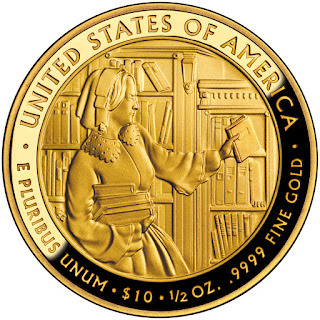 The reverse (tails) design depicts Mrs. Fillmore shelving books in the library that she established at the White House. The ongoing series of 24 karat gold coins honoring the First Ladies of the United States underwent a change with the release of the Abigail Fillmore First Spouse Gold Coin. Following several years of tepid sales levels, the maximum authorized mintages levels were reduced. When the First Spouse Gold Coin Program was launched in 2007, excitement was high and sales were brisk. The first three issues had sold out of their entire maximum mintage of 40,000 coins per design. However, early speculative would fade, as premiums for the sold out coins started to decline. By 2009, new issues of the series were selling just 25% of the established maximum. 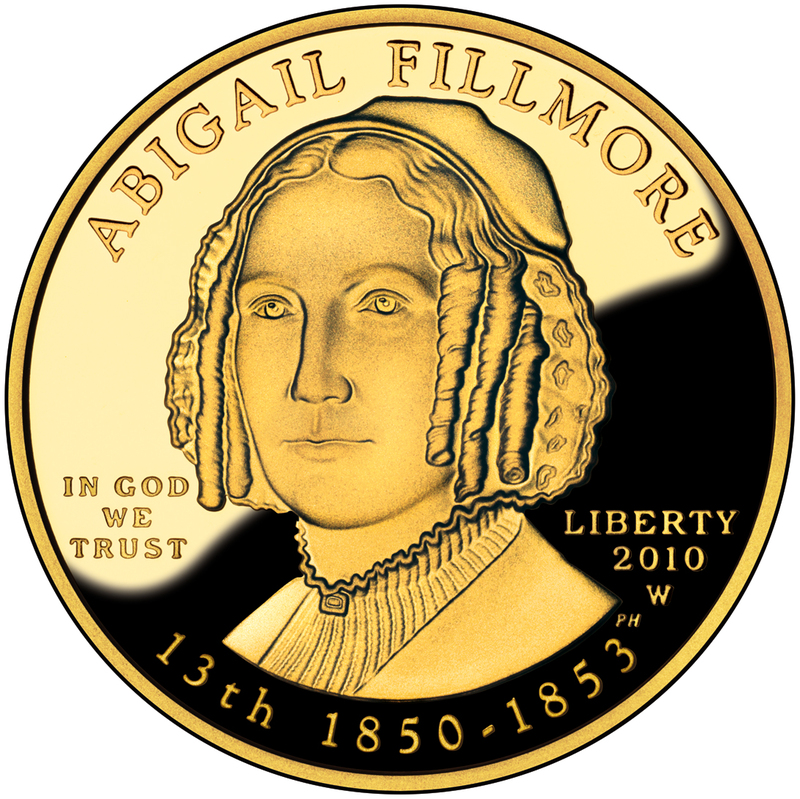 The US Mint lowered the maximum mintage for the Abigail Fillmore Gold Coin to only 15,000 across proof and uncirculated versions. The same level was used for each of the other 2010 dated releases, with the exception of the Mary Todd Lincoln coin, which had a maximum of 20,000. The United States Mint began sales of the coins on March 18, 2010. The initial pricing was set at $729 for proofs and $716 for uncirculated coins based on the average price of gold for the preceding week. There were no household ordering limits imposed. Throughout the course of the offering, pricing was adjusted as needed based on fluctuations in the price of gold. The uncirculated version of the Abigail Fillmore coin remained available for sale until late March 2011, while the proof version remained on sale until May 5, 2011 when the coins featuring Eliza Johnson were released. Final audited mintages were 3,482 uncirculated and 6,130 proof coins. The combined total of 9,612 was higher compared to the previous four releases of the series.